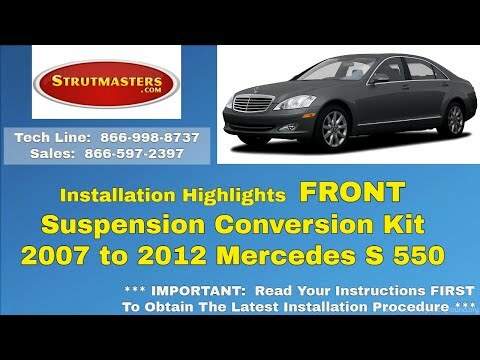 2007-2012 Mercedes-Benz S550 4MATIC 4 Wheel Air Suspension Conversion Kit With Light Fix (MU24FM) is the perfect solution to your air suspension problems. Designed to be very affordable, you can convert your air suspension to use standard. = TOTAL: Over $7,500 (and that doesn√¢¬Ä¬ôt even include replacing electronic components that are known to fail such as the height sensors). = TOTAL: Over $3,000 (and that still doesn‚Äôt include replacing electronic components that are known to fail such as the height sensors). + Over-the-phone technical support and a Limited Lifetime Warranty = Only $1,595 (plus s&h). 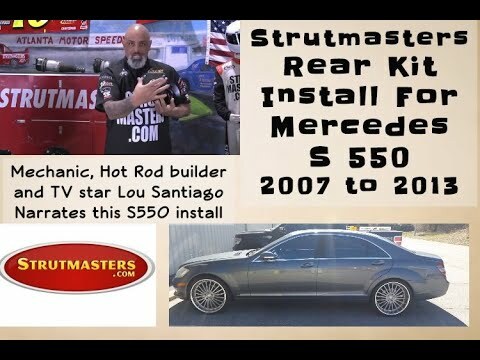 suspension, the mechanic who removed and installed the parts found that the instructions that came with the struts made the job easy, but refused to finished the electrical part, he didnt want to cut the wires as indicated with the instructions, but I was able to locate a STRUTMASTER video on their website, I followed the instruction and I was able to do the electrical wiring myself. Thank you for saving me thousands of dollars.